PATHWAYS TO SUCCESS PROGRAM - Oregon Tradeswomen, Inc.Oregon Tradeswomen, Inc.
With a focus on apprenticeship, Oregon Tradeswomen’s Pathways to Success program offers the Trades and Apprenticeship Career Class (TACC); an 8-week, pre-apprenticeship training class that helps students prepare for a high skill, high wage career in construction. TACC introduces a variety of trades through field trips, guest speakers, hands-on work days, and other training opportunities. Oregon Tradeswomen’s TAC Class is offered at no charge to participants thanks to generous funding from foundations, industry, and individual donors. In addition to the core curriculum of our pre-apprenticeship program, students enrolled in the Trades and Apprenticeship Career Class have the option of extending their training commitment an additional 1-3 weeks to enroll in the Industrial Fabrication track or the Environmental Worker Training track. This is a voluntary additional training track providing a targeted introduction to and hands-on experience with welding, machining, shop math, and blueprint reading in order to prepare students to enter skilled careers in the broad and booming manufacturing industry. This additional training track runs up to 3-weeks and will offer up to 80 hours of welding education. The successful completion of this training track meets the qualifications to take a Flux Core certification test. This optional training track provides a 40 hour hazardous waste operations and emergency response (HAZWOPER) certificate, First Aid/CPR, and AED certificates at no cost to participants. It also includes an additional day of classroom education about environmental careers, such as deconstruction, hazardous waste abatement, and environmental remediation careers, as well as additional field trip days to sites where industry partners are doing this work. Register for an Information Session about the class, the first step to enrollment in the program. Upon graduation, Oregon Tradeswomen career counselors assist TACC graduates with their job search and application to apprenticeship training programs. Oregon Tradeswomen career counselors also provide individualized employment counseling throughout the entire course of the graduate’s trades career. 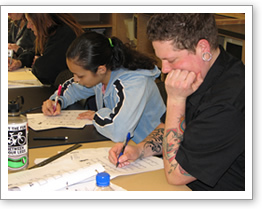 Oregon Tradeswomen’s pre-apprenticeship program complies with the industry standard of zero tolerance for drug use. This includes marijuana. Oregon Tradeswomen conducts two drug tests during our program, once on the first day of programming at the mandatory Orientation, and one random urine test during the period class is in session. If you test positive at either of these times, you will be dismissed from class and asked to re-enroll at a different time when you are able to pass the drug tests. Be able to pass a drug test – we test! Worksystems received a grant to help connect qualified and interested community members to training and career opportunities in truck driving! These are excellent jobs with high wages and truck drivers are in high demand right now. You don’t necessarily need to travel; many local employers need truck drivers now! Worksystems, the local workforce development agency, is partnering with local pre-apprenticeship programs Constructing Hope and Oregon Tradeswomen to refer interested people into truck driving opportunities to help connect jobseekers to training resources to place them in quality truck driving careers. We are using foundation funding to specifically prioritize diversifying the industry and are prioritizing connecting with women and people of color for these opportunities. Additionally, an applicant needs to be currently receiving food stamp benefits and participants also need to live in Multnomah County.